Keep up with all new episodes! Subscribe on iTunes or Stitcher. We’ve all seen those Genius Bars in the Apple Store where they help you with anything you need to know about your apple device. Well, what if a place like that existed in your classroom? 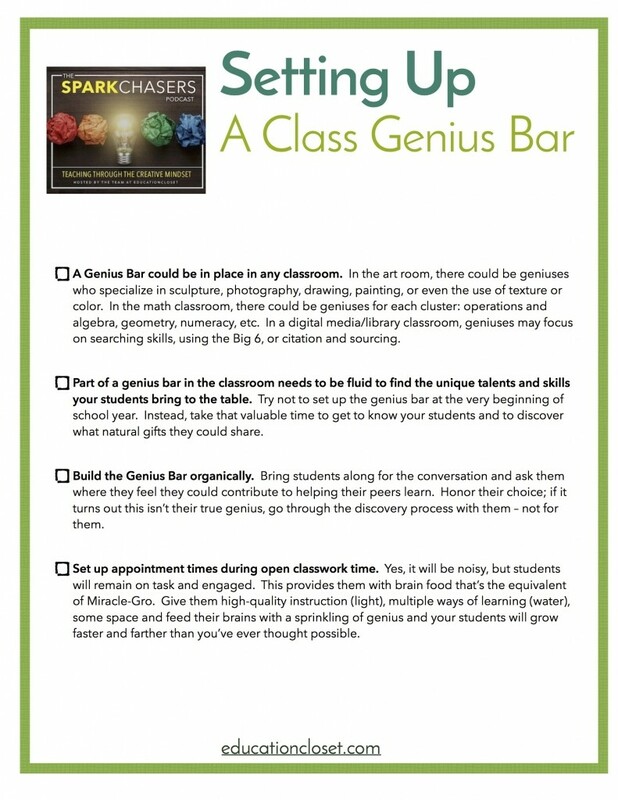 In today’s episode, I’m diving into an extraordinary learning tool called the Classroom Genius Bar. You’ll hear how to set it up in your classroom and why it’s a significant step toward student empowerment. By using this strategy just a few times per week, you’re helping student learn from each other and share their own unique talents and gifts with their peers. This isn’t just a Genius Hour…this is a true culture shift in your classroom. Today’s free resource is my Class Genius Bar Setup Cheat Sheet. Everything you need to remember when carving out your own class genius bar! What tools do YOU use to stay organized? Let us know in the comments below!